Traditional businesses are finding great advantages from the incorporation of e-business capabilities, especially for participation in the global economy, which is inherently open and dynamic. This imposes a requirement that businesses must coordinate with each other if they are to be most efficient and successful. To aid in this coordination and achieve seamless and autonomic interoperation, e-business partners are chosen to be represented by service agents. However, before agents are able to coordinate well with each other, they need to understand each others’ service descriptions. 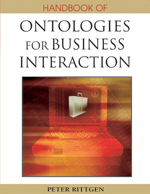 Ontologies developed by service providers to describe their service can render help. Unfortunately, due to the heterogeneity implicit in independently designed ontologies, distributed e-businesses will encounter semantic mismatches and misunderstandings. We introduce a compatibility vector system, created upon a schema-based ontology-merging algorithm, to determine and maintain ontology compatibility, which can be used as a basis for businesses to select candidate partners with which to interoperate.